Please note: before attempting an exchange through your account, you must add all of the relevant passengers to your account, before proceeding with any exchange steps, or the exchange will not work. The tutorial for doing so can be found here. If you wish to exchange your tickets, you can visit the tickets section of your account and click on the exchange button. From there you will then be able to search for a new set of tickets, which you can exchange against your existing ones. There may be a price difference, so an additional payment may be required. Or if you’re lucky, we can refund you! If there is an issue with your exchange and it does not work, then you can always cancel your ticket and then book a new one. Please take note of your fare conditions to make sure that the refund and exchange conditions are identical. If they are not identical, then please get in touch with us and we will happily exchange your tickets. Do consider that we will need to know some time in advance. So if you need to make a last minute exchange, it is best to do so at the station or by phone. You can click here to find all important phone numbers. If you have booked your tickets without creating an account and the refund and exchange conditions are identical (e.g there’s a €5 exchange fee and a €5 refund fee). Then you can simply cancel your tickets and rebook. There is no price difference in this case as both conditions are the same. If the refund/exchange conditions of your ticket are not identical (e.g. it’s non-refundable yet exchangeable for a fee) then you can make an exchange by creating a Trainline account. Please visit the confirmation page of your booking. You can find the link to this in your confirmation email. Scroll to the bottom of the page and click on “Learn more”. Sign up to create an account. As soon as you have signed up, your ticket will automatically be imported into your new account and stored in the “Tickets” section. You can then proceed with exchanging your ticket. Visit the Tickets section and then click on “exchange”. Once you have done this you will then be able to search for a new set of tickets, which you can exchange against your existing ones. If there is a price difference and/or cancellation fee, you may have to additionally pay. Or if you’re lucky, you’ll get a refund! All Deutsche Bahn tickets have identical exchange and refund conditions. So you can choose to cancel your tickets through your Trainline account or you can make an exchange directly on our website (conditions are explained below) by following the SNCF/Eurostar exchange tutorial above, as well as directly through Deutsche Bahn’s website. If you wish to exchange your tickets through Deutsche Bahn’s website, please click here to get started. 1. You did not opt for a seat reservation in 2nd class. 2. You wish to make the exchange before the day of departure. Please note: once the day of departure has arrived, Flexpreis tickets cannot be exchanged on our website, but they can still be exchanged on Deutsche Bahn's website. If you have booked a ticket from one of these operators, then you can make an exchange directly through their website. For Trainline account holders, please visit the tickets section of your Trainline account and there you will be re-directed to the relevant website to make your exchange. 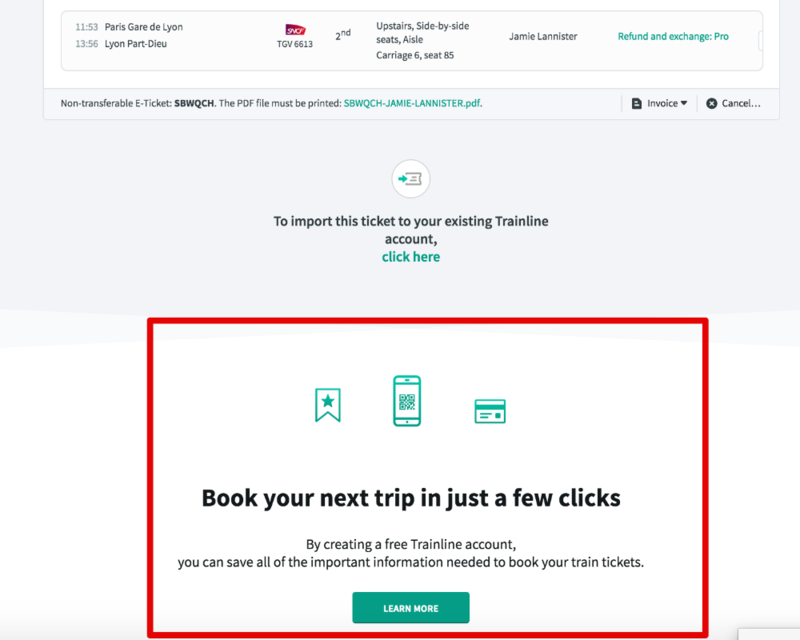 If you do not have a Trainline Europe account, you can visit the confirmation page of your booking (accessible from your booking confirmation email) and from there you will be redirected to the relevant website to facilitate your exchange. An exchange is only possible up to 12 hours before departure and only against another OUIBUS ticket. To exchange your ticket on OUIBUS.com there will be a €5 charge (or £5 if departing from London) per passenger. If exchanging by phone +33 9 69 32 33 48 from 8.30 to 20.00) a €10 charge incurs per passenger (£10 if departing from London). Trenitalia has a variety of different fares, which also have different conditions for making an exchange. Please consult your booking confirmation email, the Tickets section of your Trainline account or the confirmation page of your booking (a link to this can be found in your confirmation email) for detailed instructions on exactly how you need to proceed. There are many Trenitalia fares that only permit exchanges to be made at a ticket counter at a station in Italy. If this is the case, you will not be able to make an exchange via Trenitalia’s website. Please note: Trenitalia Economy fare can only be exchanged directly at a Trenitalia ticket counter at a station in Italy. This fare cannot be exchanged online. 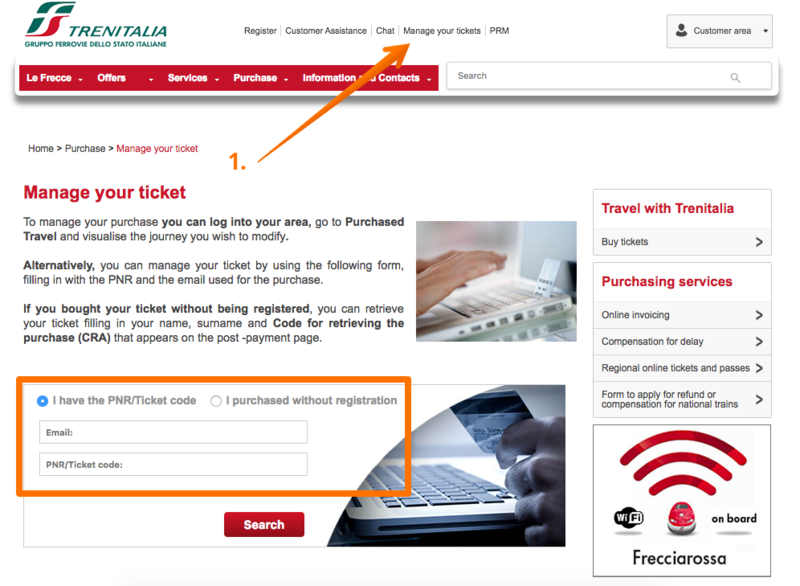 If (and only if) your Trenitalia fare allows your ticket to be exchanged with no fees, you will be able to exchange your tickets directly on Trenitalia’s website. Just follow the instructions below and it should be very simple! 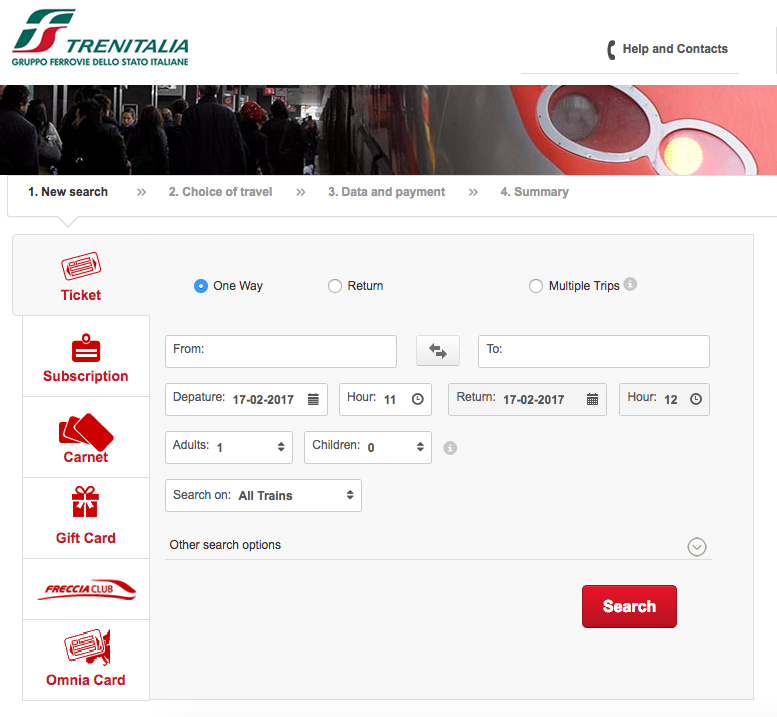 Please visit www.trenitalia.com and click on “Manage tickets”. From there, you will need to enter your booking email address that you provided to Trainline and your 6-character booking reference. From there, you are able to select the “Change Booking (date/time of departure)” option to begin with the exchange. You will then be able to search for a new departure time and date and proceed with the exchange. 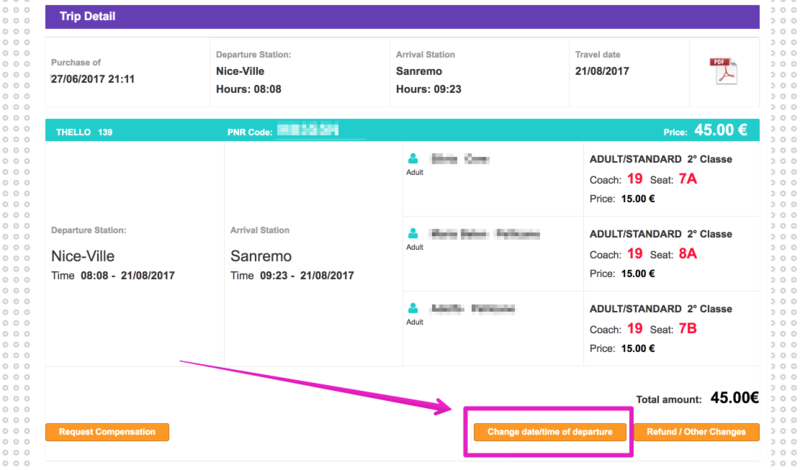 When the fare conditions allow it, you can exchange or modify your Italo booking directly on our website by following the above tutorial for SNCF, Eurostar, Thalys and Lyria tickets. 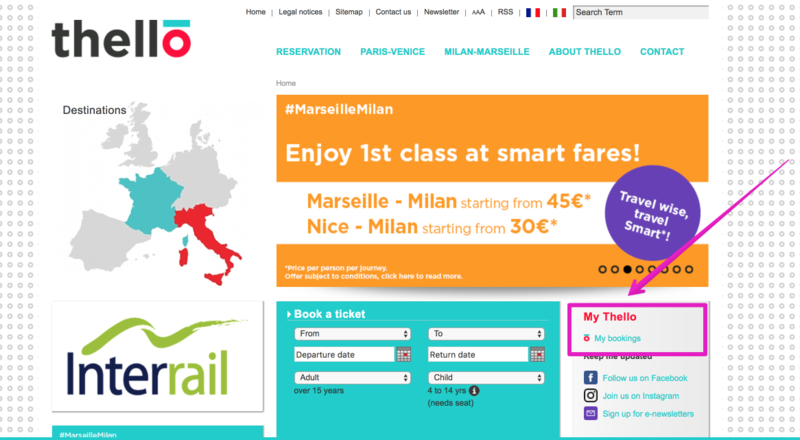 Thello has a variety of fares and some of these allow exchanges. Please consult your booking confirmation email, the Tickets section of your Trainline account or the confirmation page of your booking (a link to this can be found in your confirmation email) to find the fare conditions for your ticket. If the fare permits an exchange, you can do this directly via www.thello.com. You will then be asked to enter your email address and booking reference. You will need to enter the same email address that you have used to book your tickets. From here you are able to select the option to change the date or time of departure of your ticket. The majority of all Renfe tickets can be exchanged by cancelling and then re-booking. This is because the exchange and refund conditions are identical e.g. both carry a €5 fee. So this means there is no price difference in making an exchange or simply cancelling plus re-booking. Please have a look at the fare conditions for your ticket to find out the exact exchange instructions. If you do not have a Trainline Europe account, the fare conditions can be found in our confirmation email or on the confirmation page of your booking. For account holders, it can be found in the “Tickets” section of your Trainline account. To cancel and re-book your tickets, please follow the instructions provided on this page. We’ll be happy to take care of the exchange for you as quickly as we can! There is no official exchange process for tickets with these carriers. If your conditions allow it and are refundable (or partially refundable), you must cancel your booking and make a new one.